Once upon a time, Wyatt received a little butterfly hatching kit for his birthday. It came with five or six buckeye butterflies, which all hatched and were a lot of fun to see transform from caterpillar to butterfly. When we shared our excitement with our neighbors, they told us they had some monarch butterfly caterpillars in their front yard that we could also "hatch" if we wanted to. We wanted to. This led to the beginnings of a vision. 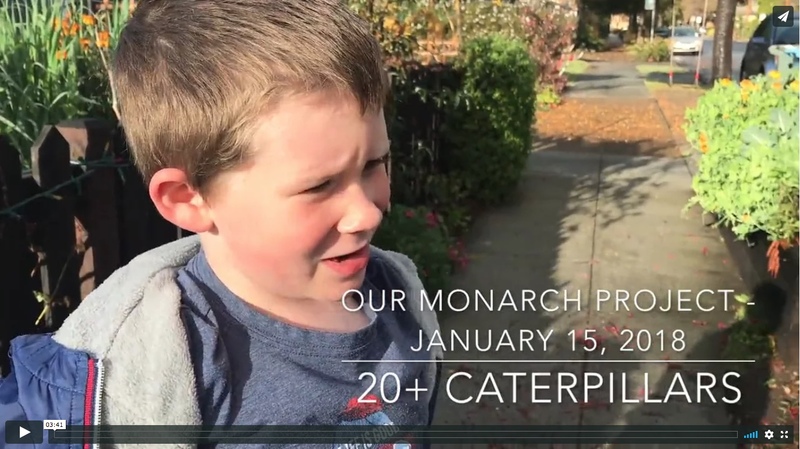 A grand save the monarch project. A butterfly nursery. We heard about tagging programs that allowed you to track the Monarch's you released on their famously long migrations. But after we hatched two monarch butterflies, the caterpillars disappeared. We didn't see another caterpillar for about two years! We didn't know how long we'd have to wait. Instead, we got to work building Wyatt's butterfly nursery, which then sat empty for months and then years. But all that changed about a week ago when our neighbor left a jar full of Monarch caterpillars on our front step, and then another and then another. At the time of this writing, we have more than 26 in our nursery, 11 of which are now in crystalis. Good things come to those who wait! Check out our short video of the action so far. In a couple of weeks, we'll put up another so that you can see what's going on!